In 2006 Stage Rig merged with the film and entertainment rigging specialists Tri-Point Rigging Services. Together the two companies combine a wealth of Rigging and Scaffolding knowledge from Australia and overseas, the technical know-how and equipment to undertake any project, and a supply of very experienced, licensed and committed Rigging and Scaffolding crew. Because our team works specifically in the Event and Entertainment Industries, we understand the coordination requirements, and the complexities which are associated with working on large and small scale public events. Stage Rig offers a wide range of equipment including Layher Scaffolding, Scaffold Decking, Chain Motors, Chain Blocks and Rigging Equipment, and a Tomcat Ground Support System. Tri-Point Rigging Services has a huge selection of equipment to complement any project, including drapes, scrims, blue and green screens, and a CLS Ground Support System. With projects such as the AJC Spring Carnival Racing in Sydney, World Youth Day 2008, and the FINA 2007 Swimming Championships in Melbourne completed, Stage Rig has the equipment, the experienced people and the infrastructure to supply your next project with a complete decking, rigging or staging package. 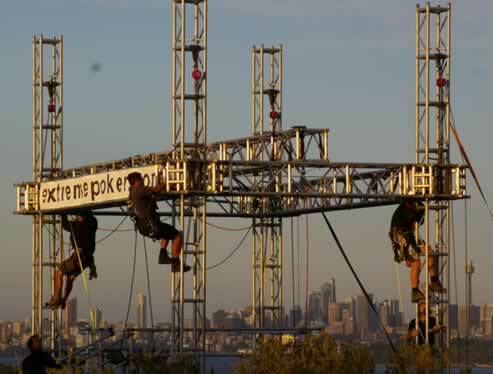 Stage Rig was formed in 2001, after aquiring resources and equipment previously used by Scafform Australia. Scafform was instrumental in the installation of press tribunes and rigging for the Darling Harbour venue and Showground Pavilion Venues leading up to the Sydney 2000 Olympic Games. Since its inception, Stage Rig has provided temporary Decking, Staging and Seating for a number of high profile clients and events, including the 2002 Ray Charles Concert at Wyndham Estate, press and camera tribunes for the 2003 Rugby World Cup, Rigging for the 2001 Goodwill Games in Brisbane, Corporate Decking for the 2001 and 2002 PGA Golf Tournaments, and Corporate Decking for the 2001 and 2002 Bathurst V8 Car Racing. Other clients include SOCOG, Opera Australia, Newcastle Knights, City of Sydney, Cambridge Events, Channel 7, Big Day Out and The Australia Day Council of NSW. Stage Rig has also provided Rigging Services at the Melbourne, Sydney and Brisbane Convention and Exhibition Centres, supplying Rigging for events such as The International Motorshow and the Sydney International Boat Show.